Let’s start. We will use the Chinook database which is a simple but quite useful database for testing. You can download it for free here, otherwise you can find and execute the SQL script inside the App_Data of the project we will build (check download link at the bottom). Those are the only assemblies you need to start querying data with the SqlCommand class. Also inside the Program class create a variable to hold your sql connection string. You will use it every time you need to open a connection to your database. Make the respective modification to reflect your sql server instance. You have to create a SqlConnection object and open the connection through it. Then you create an SqlCommand where you pass exactly the SQL query you want to execute in your database pointed from you connection string. Since your SQL query returns multiple results you retrieve them using a SqlDataReader object. You can iterate through it’s records using a while statement. The ninth line of the above code could be replaced with the following, showing that each index corresponds to the column name retrieved from your database. You can execute any Select statement you want using the SqlCommand. Hence, if you want to filter your results and get specific albums (let’s say those that belongs to artist with ArtistId=1) you would write something like this. If you wish to query a column value with different name that’s fine. The SqlDataReader object will understand exactly what you want. Here we changed the AlbumId column name to ID and the Title to Album. Later we retrieved those values through the reader[“ID”] and reader[“Album”] respectively. Now let’s try something different. Let’s query a scalar result, an integer for example from the database. Assuming we want to get the total Invoices for a customer we would write..
SqlCommand.ExecuteScalar function returns the first column of the first row of the result set. You often use it when we want to retrive a specific value, not a record. Let’s try to query a View result now. Create the following View in your Chinook database in order to get all Album Tracks. Since you request a result set you use the ExecuteReader function, not the ExecuteScalar. Executing a Stored Procedure with the SqlCommand object is slightly different. You have to declare that the command is of type CommandType.StoredProcedure and then define the parameters and their values. Let’s create a stored procedure that returns all tracks of an album. It accepts two parameters, the album title and an output parameter that will have the number of tracks retrieved. Let’s count and print the “Restless and Wild” album tracks. First of all we changed the CommandType to StoredProcedure. We also defined an output parameter with the Direction = ParameterDirection.Output. Mind that you can use it’s new value after the SqlDataReader using statement. Normally, we use User Defined Functions inside a Store Procedure but anyway, let’s see how to query both scalar and multi-statement results from a User Defined Function. The following function returns the total invoices for a customer. You can call that function in the way you called the view. The following function returns a table. More specifically returns a customer invoices. You can view them like this. You can pass an Insert SQL statement to the SqlCommand as well. Add and configure any parameters needed. Assume you want to add an Album record. Since we wanted to get back the new AlbumId generated we added the “select CAST(scope_identity() AS int)” statement. Let’s try something interesting now. Assume that you wanted to get back not only the generated Id but the Title and the ArtistId too. We used the output inserted.AlbumId, inserted.Title, inserted.ArtistId Insert properties and an SqlDataReader to access them. 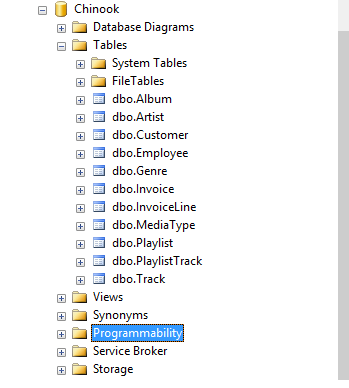 Let’s insert a new album now using the following stored procedure. Updating data is pretty much the same. Let’s assume we want to update an album’s title, and get back both the old and it’s new title. Let’s try it without a stored procedure. Create a Stored procedure that updated an Employee’s record values. Execute it as follow. Notice that this time we only want to know if a row affected that is updated or not and that’s why we use the SqlCommand.ExecuteNonQuery() function. That’s it, I hope you understood how to use an SqlCommand object to access your database. Download the project we created from here. Make sure you follow this blog to get notified for new posts!